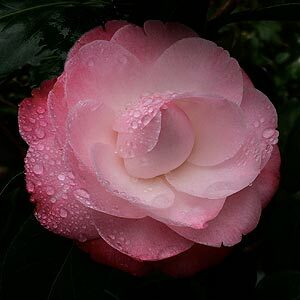 With soft and mid pink, formal double flowers last well through from mid winter Camellia x japonica ‘Desire’ is very attractive pink flowering variety. A naturally upright small shrub it is medium to slow growing with a good bushy habit. Best grown in shade, but reasonable light to perform at its best. Flowering from mid winter to spring this is another excellent plant with deep green foliage that offsets the flowers beautifully. The flower color will vary a little, tending to wash out a little in strong sun. Flowers are semi double light pink and contrast well agaianst the dark foliage. Mulch to mainaytin a cool root run. Spread – A fairly upright habit, over time will spread to around 1 metre. Soil – Humus rich slightly acidic and moist yet well drained.